Five Takeaways From Thursday At The Republican Convention : It's All Politics It was Mitt Romney's big night. He got to tell the nation about what he wants to do. But the evening was also about President Obama. And, rather oddly, about Clint Eastwood. Mitt and Ann Romney (center) are surrounded by family members and balloons at the end of the 2012 Republican National Convention on Thursday in Tampa. 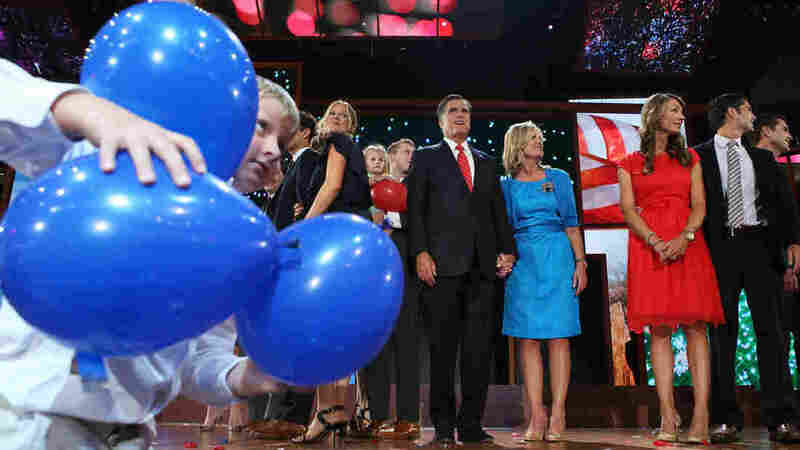 If you missed some of Thursday's action at the Republican National Convention, when Mitt Romney accepted his party's presidential nomination, we were live blogging here and you can always read through it to see how the day and evening went. "How many days have you woken up feeling that something really special was happening in America? Many of you felt that way on Election Day four years ago. Hope and Change had a powerful appeal. But tonight I'd ask a simple question: If you felt that excitement when you voted for Barack Obama, shouldn't you feel that way now that he's President Obama? You know there's something wrong with the kind of job he's done as president when the best feeling you had was the day you voted for him." -- Romney's Faith Is Something To Be Celebrated: The former Massachusetts governor could become the first Mormon to be elected president. So far in the campaign, most stories about that have focused on whether some voters might be uncomfortable because they're unfamiliar with the Church of Jesus Christ of Latter-day Saints. Up to now, the candidate and his campaign hadn't talked much about his faith. Tonight, they had friends tell about how he helped them through truly heartbreaking times. "It seems to me when it comes to loving our neighbor, we can talk about it, or we can live it. The Romneys live it every single day," said a tearful Pam Finlayson, after talking about how Romney and his wife, Ann, helped and consoled her following the death of her daughter. -- It's Also OK To Talk About Bain Capital: Romney has taken a lot of incoming fire from the Obama campaign for his record as head of an investment firm that put money into some winners and created jobs — but also backed some losers that closed and cost workers their livelihoods. Tom Stemberg, the founder of one company that Bain helped get started — Staples — turned the issue back on Democrats: "You have to ask yourself: Why would an administration that can't create any jobs demonize someone who did? I've got a theory. I think when it comes to jobs, new businesses, and economic growth — they just don't get it. They say that Mitt Romney is out of touch with ordinary Americans. They just don't get it." -- Some Love From Brother Bush: Former Florida Gov. Jeb Bush, departing from his prepared remarks, used the start of his address to the convention to honor his father (former President George H.W. Bush) and his brother (former President George W. Bush). It was one of only a few moments this week when George W. was spoken about from the podium, and his brother's words brought the delegates to their feet. "I love him," Jeb Bush said, and George W. "kept us safe" during "incredibly challenging times." -- On the night Obama was elected "I just thought, this is great. Everybody's crying. Oprah was crying. I was even crying. And then finally — I haven't cried that hard since I found out that there is 23 million unemployed people in this country." -- "What do you want me to tell Romney? I can't tell him to do that. ... He can't do that to himself. You're crazy. You're absolutely crazy. You're getting as bad as Biden." -- Vice President Biden is "just kind of a grin with a body behind it." -- "You could still use the plane. Though maybe a smaller one. Not that big gas guzzler when you're going around to colleges and talking about student loans and stuff like that." -- "I'd just like to say something, ladies and gentlemen. Something that I think is very important. It is that, you, we, we own this country." -- "We don't have to be — what I'm saying, we don't have to be ... masochists and vote for somebody that we don't really even want in office just because they seem to be nice guys or maybe not so nice guys if you look at some of the recent ads going out there. I don't know." Well, Mr. Eastwood, with that we think we'll call it a day. Or a convention. Or a night. Or whatever. We don't know. Now it's on to Charlotte, N.C., where the Democrats get together next week.